Accident near Ranikhet hills. Troops of Garhwal Rifles battalion of Indian Army acted swiftly and rescued critically injured driver. Condition of driver is now stable. 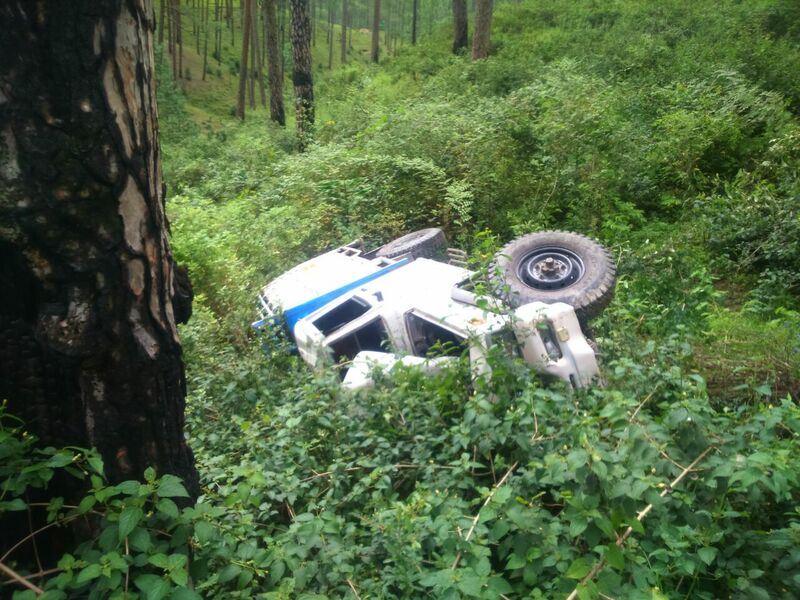 At approximately 0930h today morning, while it was raining heavily, a Jeep with construction loads which was standing close to a steep slope lost control and slipped off into a gorge near Dhulikhet village, Ranikhet in the Kumaon hills. The driver of the vehicle was stuck inside while the vehicle turned turtle and toppled down the gorge. The vehicle stopped after hitting a tree, after a fall of almost 25 -30 meters. The Driver was unfortunately thrown out and was crushed between the tree and the vehicle with severe injuries below his chest. A senior NCO of the Garhwal Battalion stationed in the vicinity saw the accident from a distance and immediately organised a small rescue team of five soldiers and rushed to the spot. The Army jawans were able to manually push the vehicle away as it toppled further down the gorge. Since the driver was grievously injured and could not be carried away, the NCO using ingenuity prepared an improvised stretcher and evacuated the injured driver to the road-head from where he was rushed by Ambulance to a civil hospital. The driver though injured grievously is now stable.